The Curious Phenomenon of Infrasound – Guest post by Paul Southern. Today I have the wonderful Paul Southern on the blog taking about Infrasound, one of the major themes of his new book Killing Sound. Killing Sound is a book that explores the grey area between science and superstition. It has been described (accurately, I think) as a cross between Inception and The Exorcist. It is a book with big ideas, both mythological and scientific, that deals with magic, séances, spirits and the supernatural and what really lies behind them. Like a lot of people, I have been fascinated with the supernatural since I was a child, and have often wondered what people meant when they said they saw ghosts. Were they seeing real objects or was their mind playing tricks on them? More importantly, did it matter? If you perceive a ghost to be there, you experience the same fright, and the same alarm. Magazines like The Skeptical Inquirer, and famed sceptics like James Randi, have challenged many bogus claimants and put science firmly on top in the battle of science and faith. Yet, bafflingly, many people cling to faith and belief in the supernatural, whether it be dead spirits of loved ones, demons or angels. A few years ago, I stumbled across an article in the Journal of Psychical Research that had me wondering whether both could be true. It concerned the curious phenomenon of infrasound. Infrasound is all around us, yet perceived only subconsciously. It refers to extreme bass waves or vibrations with a frequency below the audibility range of the human ear (20 Hz to 22 kHz). Even though these waves can’t be heard, they can be felt. They can induce feelings of anxiety, extreme sorrow, and chills. Loud infrasound in the range of 0.5 to 10 Hz is sufficient to activate the vestibular, or balance system, in the inner ear. It activates the fight or flight mechanism. It can cause the hairs on your neck to rise and grey objects to appear in your peripheral vision. In essence, it makes you see ghosts. NASA has conducted research on it and their pilots have reported visual disturbances at high altitudes and in simulators, which are often attributable to UFO’s. You don’t need to be an astronaut to experience infrasound, however. It’s all around us. If you really want to expose yourself to high levels, you need do no more than travel the London Underground. At Kennington Loop on the Northern Line, 90-95db has been detected. That’s as loud as a lawnmower. When infrasound reaches a certain frequency, something spectacular happens. Your eyeballs start to shake – they have reached their resonant frequency – and you start to see things. Your survival instinct kicks in, the nape hairs stand up, and you want to run. Who wouldn’t? It is probably no coincidence that the London Underground has more reported ghost sightings and paranormal incidents than any transport system in the world. Just ask the trackwalkers. They know it best. When the city sleeps, they check the tunnels by torchlight. Footsteps in the ballast, ghosts on the Northern Line, they’ve seen it all. And when they haven’t, the CCTV does. You’d be amazed what’s been following you without you realising. Every line has its ghosts. Every walker knows where they are: Kennington Loop, South Island Place. It takes a special individual to visit those places for a living. It takes a braver one to walk the miles of disused tracks and bricked off tunnels others have long forgotten. In disused tunnels beneath the Thames, huge gales blow, and the temperatures can drop inexplicably. Even sceptics feel a weird presence there and have heard strange noises. Put yourself underground, in long, dark, seemingly endless tunnels, and belief in science quickly erodes. Instinct takes over. For the person who sees the ghost, who experiences the paranormal, the sensation is real. You are actually seeing something, just like the NASA pilots, just like the trackwalkers. The characters in Killing Sound are forced into this nightmare world. They soon discover the horror that is down there. The problem is, there is no way out. 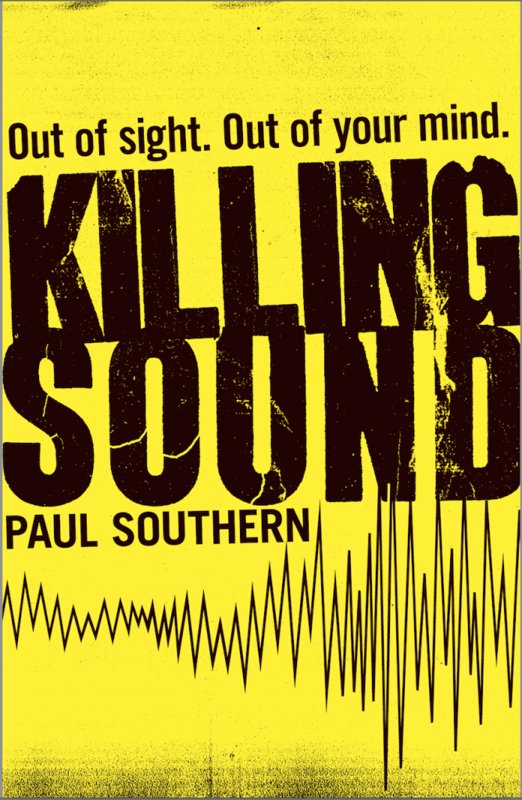 Killing Sound by Paul Southern is out now in paperback (£7.99, Chicken House) For more guest posts by Paul Southern please visit the blogs mentioned in the banner.